Mountain West Financial Named a Freddie Mac Home Possible RISE Winner! 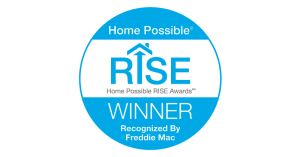 We�are proud to be recognized as a Home Possible Rise Award winner! Freddie Mac is recognizing companies for sustained excellence with Home Possible with the Home Possible RISE Award. The award celebrates top performers helping low and moderate-income borrowers to become homeowners. The Award is split into six categories for: Greatest Volume, Fastest Growth, Correspondent Volume, Broker Volume, New Originator and Education. Mountain West Financial is recognized as a winner of one of the Rise Awards for Fastest Growth. Mountain West Financial is one of three companies that represented the fastest growth in 2017 for Home Possible mortgages and has amped up their efforts by leaps and bounds for first-time, low to moderate-income homebuyers. They represent the top originators from national to local organizations. �We make it a priority at loan registration to see if our borrower and their property meet the Freddie Mac Home Possible program guidelines.� The Home Possible and Home Possible Advantage loan products are really the best option for those homebuyers who can qualify, as the pricing advantages make the overall mortgage payments lower and more affordable for homebuyers when compared to other financing. �We support this product 100% at every level and are proud to be recognized as a recipient of the RISE Award,� said Tonya Todd, SVP Strategic Products at Mountain West Financial, Inc.